CNG: eAuction 438. GALLIA LUGDUNENSIS. Æ As (28mm, 10.22 g, 6h). Struck during the Civil War, AD 68-69. 438, Lot: 326. Estimate $150. GALLIA LUGDUNENSIS. Æ As (28mm, 10.22 g, 6h). Struck during the Civil War, AD 68-69. 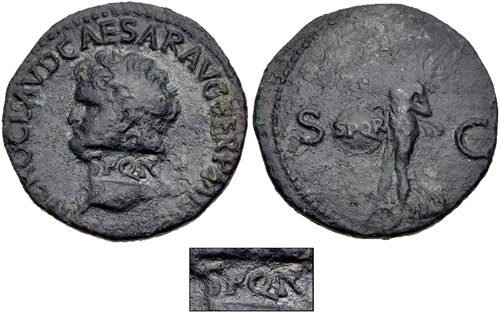 SPQR in rectangular countermark on a bronze as of Nero. Pangerl 26. Host Near VF, c/m VF, dark green patina.